Listed below is a description of publications offered by the SFAA. Many of these items are available online for Members and Subscribers or are available for purchase. This binder contains standard forms of bonds, policies, riders, endorsements and applications that were promulgated by The Surety & Fidelity Association of America for the fidelity, forgery and crime lines of business. If you are interested in obtaining the most relevant data available to help you to determine how your organization’s total compensation package measures up in today’s competition for talent, consider participating in or purchasing the annual SFAA-sponsored industry Compensation Survey, the premier source for industry compensation data. Only members of SFAA are eligible to participate and/or purchase the survey. 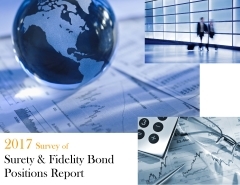 SFAA members collectively write 97% of the surety and fidelity premium in the United States, positioning the survey as a unique opportunity to benchmark with your peers. For more information, contact survey vendor Allan Fitzgerald of Fitzgerald’s Compensation Consulting Services, Inc. at 704-795-9800 or afitzgerald@ccs-consultants.com. Changes in survey design are managed by the Diversity & Human Resources Advisory Committee, staffed by Barbara Reiff (breiff@surety.org). Construction Executive is the magazine for the business of construction. It reaches more than 53,000 contractors and construction-related business owners. Engineering News-Record provides the engineering and construction news, analysis, commentary and data that construction industry professionals need to do their jobs more effectively. This Manual contains fidelity, forgery and surety underwriting rules, loss costs, rating plans, risk types and class codes. Purchasers of the Manual will receive updated Manual pages until update service is cancelled by the purchaser. The Surety & Fidelity Association of America reserves the right to impose a periodic maintenance fee to defray the printing and distribution costs of the updated Manual pages. You are free to opt out of the Manual page update service at the time of purchase (See order form). Note: You must be a member of the Association or an agent appointed by a member company in order to purchase this manual. Evidence of appointment must accompany order. The Mentoring Quick Guide was developed by the SFAA Diversity & Human Resources Advisory Committee, Learning & Development Work Group. This document (toolkit) has comprehensive information focusing on four areas: Leadership Commitment and Organizational Accountability; Talent Acquisition Strategies; Learning & Development; and Engagement and Networking. Each component includes a menu of options, tools and practices for use in the development or enhancement of a company-specific diversity & inclusion strategy based on where the organization aligns with its diversity & inclusion goals. The modular structure was designed to enable members to utilize the resources in part or in full. This publication includes the text of the performance and payment bond statutes of all 50 states and the District of Columbia. For each state, there is a commentary describing the state's Little Miller Act and any unusual ways in which it has been interpreted. This publication is a loose-leaf notebook with separate tabs for each state, and it can be supplemented as amendments or court decisions warrant. The Recruiting Brochure: Careers that Make a Difference brochure, developed by the SFAA Diversity & Human Resources Advisory Committee, was designed for use as a stand-alone piece or in conjunction with corporate recruiting materials. Statistical reports are available for SFAA members and Subscribers in electronic format. Non-members may purchase these reports. Information about our data collection process, descriptions of reports, and a printable report order form are available through this page. This book was written specifically for the construction surety underwriter, containing brief statements of the law on a variety of relevant issues, and organized into state-by-state chapters. This publication is designed to provide information about the subject matter covered. It is provided with the understanding that the publisher is not engaged in rendering legal services. If legal advice or other expert assistance is required, the service of a competent professional should be sought. Laws, regulations and bond forms regarding surety bond requirements for mortgage brokers and lenders change frequently. Please note the information provided is the information available as of the date of this Survey. If you note any incorrect information, or if you become aware of any legislative enactments, bond form revisions or regulatory changes regarding mortgage broker or lender surety bonds, please contact SFAA at (202) 463-0600. Research current through August 2017. The Surety & Fidelity Association of America provides a variety of webinars as a service to the industry to promote the use of fidelity and surety bonds to protect public and private interests. Whether the liability is on a "last-on surety" basis. Research current through 5/24/2010. Last updated 12/13/2012 for Pennsylvania.